Eighteen YouTube stars led by a Santa costumed Casey Neistat turned an abandoned mall in Milwaukee into a “winter wonderland” for the area’s Boys and Girls Clubs this holiday season. In a partnership with Samsung and the Milwaukee area Boys and Girls Clubs, creators like Akilah Hughes, Ann Lupo, Shaun McBride, Jesse Wellens, and Will Haynes (you can find the full list here) taught members of the Boys and Girls Clubs to vlog after giving them gifts of cameras and gear provided by Samsung. 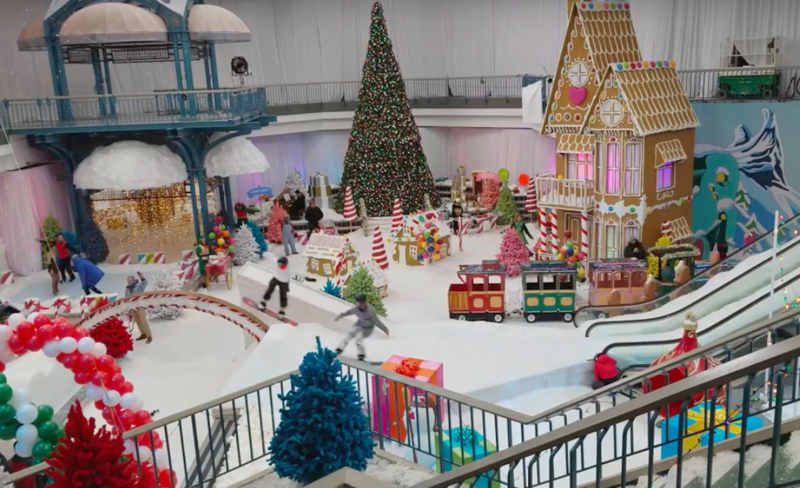 After handing out the gifts, the creators led the kids to the abandoned mall, which Neistat and company had spent a month transforming into an idyllic winter scene. Complete with snowboarders, an ice skating rink, and plenty of candy, the mall scene provided an ideal backdrop for Boys and Girls Club members eager to video the experience on their new Galaxy Note 8 phones. The full video, Neistat noted, was shot on these phones–in part by YouTube creators and in part by the Boys and Girls Club members. One Boys and Girls Club staffer noted that there’s “not necessarily too much positivity” for the kids in his group, so the mall transformation was a welcome surprise. Meanwhile, YouTube star Akilah Hughes cited her experience as a Boys and Girls Club member as a kid, saying she was never given fancy camera equipment—only a Barbie once. The video ends, naturally, with Neistat wearing a Santa suit and getting lifted up in the air by a large drone. This was not Neistat’s first time attempting such a stunt. In December 2016, Neistat also donned a Santa costume in a video collaboration with Samsung, in which a drone lifted the YouTube creator over the mountains of Finland.